1 ½ ounces of Cubay Carta Blanca Rum. Cubay Liquor drops, Grenadine flavor. All ingredients should be mixed in a composition glass. To serve the drink a cocktail glass which is decorated and flavored with orange peel and a cherry is used. Mix all ingredients in the shaker and serve strained in an 8-ounce glass. The sugar is mixed in the lemon juice, the Cubay Carta Blanca, Cubay cocoa liquor and ice is added. Beats and serve the drink. A cocktail glass is used. In the shaker mix pineapple juice, the Havana Club Añejo Blanco, maraschino and ice. Beat by hand and serve strained in a cocktail glass. Garnish with a pineapple slice. In the shaker, dilute sugar in lemon juice, the Havana Club Añejo Blanco and ice is added. Shake it and serve it into a cocktail glass. Use a highball glass and dilute the sugar in the lemon juice and a little soda. Crush the peppermint stem without damaging the leaves to release the juice and add them. Add ice and Cubay Carta Blanca rum and fill the glass with soda. Stir and garnish with mint leaves. Use a highball glass and mix Cubay Carta Blanca, lemon drops, cola and ice cubes. Stir and garnish with a lemon slice. 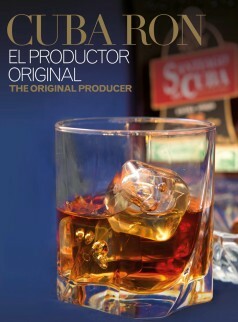 Use a highball glass and mix the Añejo 7 years, the drops of lemon, cola and ice cubes. Stir and garnish with lemon slice. Use a tall highball glass and dilute the sugar in the lemon juice. Add the Havana Club Añejo Blanco, ice and fill the glass with soda. Stir and garnish with a lemon slice and a cherry. 1 ½ ounce of Carta Blanca Santiago de Cuba Rum. Use a whisk to mix the sugar, lemon juice, maraschino, Carta Blanca and ice. Shake well and serve in glass of champagne. Use a blender to mix the sugar, lemon juice, Cubay mint liqueur, the Carta Blanca and ice. Shake well and serve in a champagne cup. Use a blender to mix the sugar, lemon juice, Cubay Triple Sec Liqueur, Carta Blanca, strawberries and ice. Shake until a velvety texture is obtained and serve on a sugar frosty cup. Use a whisk to mix the coconut cream, pineapple juice, the Havana Club Añejo Blanco and ice. Shake well and serve in a glass or cocktail glass. Mix white rum, coconut water and ice. Stir and serve with a straw in a tall glass or preferably in their natural container. In the shaker mix pineapple juice, the Havana Club Añejo Blanco, grenadine and ice. Shake by hand and serve strained in a cocktail glass which will be decorated with a cherry. Use a 10 oz glass and pour into it the lemon juice, Worcestershire sauce, ice, salt to taste, Carta Blanca rum and the real tomato sauce. Stir and garnish with lemon slice. Note: Worcestershire sauce is prepared beating 1 egg with 6 tablespoons of milk, 6 tablespoons of vinegar, 1 tablespoon of sugar, 10 g. of butter, 1 tablespoon of mustard, salt and pepper to taste. The preparation is cooked in a pan in a water bath and stir until obtaining a thick, foamy cream.